I’ve grown food at several different community gardens here in Madison, WI over a ten year period, and had a home garden at the same time during many of those years. I learned a lot about what vegetables work best in a community garden setting, and which ones to leave off the list each season. Here are some special considerations when deciding which vegetables to grow in your community garden. High Maintenance vs. Low Maintenace Vegetables. The number one thing to know is that some vegetable plants require much more constant attention than others. For example, a kale seedling gets planted in early spring and basically hangs out in the garden until winter when it gets killed by heavy frosts if you live in a cold climate. During those months in between, there’s not much you need to do except keep the plants watered and harvest kale leaves whenever you want to take some home for dinner. That’s what I call a low maintenance vegetable! In contrast, bush green beans are more high maintenance. Once they starting producing beans, you need to pick those babies every other day because they grow quickly. If you don’t, you’ll end up with buckets of beans that are too big and too tough to be delicious. They need constant attention during the weeks they’re being harvested. So, why do these two categories matter? Most people who tend community gardens aren’t able to visit their plots every day. This makes growing vegetables that need daily attention problematic and often leads to frustration. If this is true for you, then you should choose vegetables that can hang out in the garden on their own as much as possible – the low maintenance vegetables. These low maintenance plants are great for growing in your community garden because the ripe fruit (or vegetable!) can chill out in your plot for a bit when it’s ready. My community garden plot. Lots of onions and garlic! When you’re planning out what to grow in your community garden plot this year, think strategically about the vegetables and focus on the ones that can be tended from afar. That way, if you get busy in summer and can’t visit for a while you won’t waste food or be disappointed that you missed out on a certain vegetable. When looking at the above list there are also other characteristics to consider about each vegetable besides whether it’s low maintenance or not – like how long you can expect to harvest food, how long you have to wait for a vegetable to grow, and how big the plant gets. 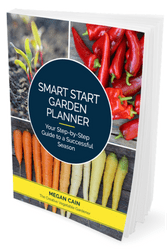 I cover all of this and more in my Smart Start Garden Planner. It’s a fresh and simple approach to planning your garden. The workbook keeps planning practical, down-to-earth, and fun! Get your copy here. I’ve read a lot about community gardening articles. This one is a breathe of fresh air to those that discuss about how to start a community garden. Your content here is very specific and very helpful for those that are very new to community gardening. Thank you so much for giving and sharing these ideas on what veggies to grow. Stop Dreaming, Start Your Community Garden and Reap the Benefits!